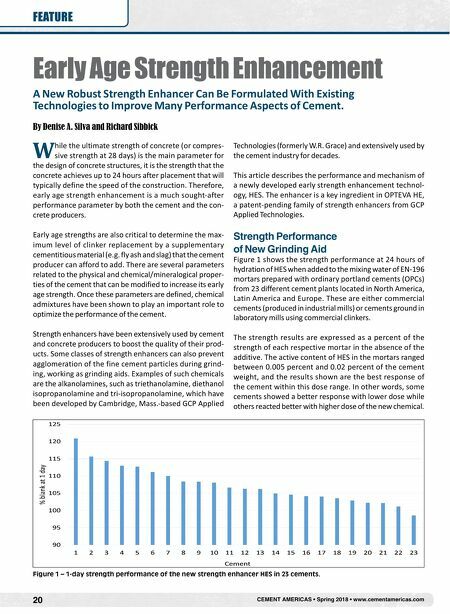 20 CEMENT AMERICAS • Spring 2018 • www.cementamericas.com FEATURE Early Age Strength Enhancement A New Robust Strength Enhancer Can Be Formulated With Existing Technologies to Improve Many Performance Aspects of Cement. By Denise A. Silva and Richard Sibbick W hile the ultimate strength of concrete (or compres- sive strength at 28 days) is the main parameter for the design of concrete structures, it is the strength that the concrete achieves up to 24 hours after placement that will typically define the speed of the construction. Therefore, early age strength enhancement is a much sought-after performance parameter by both the cement and the con- crete producers. Early age strengths are also critical to determine the max- imum level of clinker replacement by a supplementary cementitious material (e.g. fly ash and slag) that the cement producer can afford to add. There are several parameters related to the physical and chemical/mineralogical proper- ties of the cement that can be modified to increase its early age strength. Once these parameters are defined, chemical admixtures have been shown to play an important role to optimize the performance of the cement. Strength enhancers have been extensively used by cement and concrete producers to boost the quality of their prod- ucts. Some classes of strength enhancers can also prevent agglomeration of the fine cement particles during grind- ing, working as grinding aids. Examples of such chemicals are the alkanolamines, such as triethanolamine, diethanol isopropanolamine and tri-isopropanolamine, which have been developed by Cambridge, Mass.-based GCP Applied Technologies (formerly W.R. Grace) and extensively used by the cement industry for decades. This article describes the performance and mechanism of a newly developed early strength enhancement technol- ogy, HES. The enhancer is a key ingredient in OPTEVA HE, a patent-pending family of strength enhancers from GCP Applied Technologies. Strength Performance of New Grinding Aid Figure 1 shows the strength performance at 24 hours of hydration of HES when added to the mixing water of EN-196 mortars prepared with ordinary portland cements (OPCs) from 23 different cement plants located in North America, Latin America and Europe. These are either commercial cements (produced in industrial mills) or cements ground in laboratory mills using commercial clinkers. The strength results are expressed as a percent of the strength of each respective mortar in the absence of the additive. 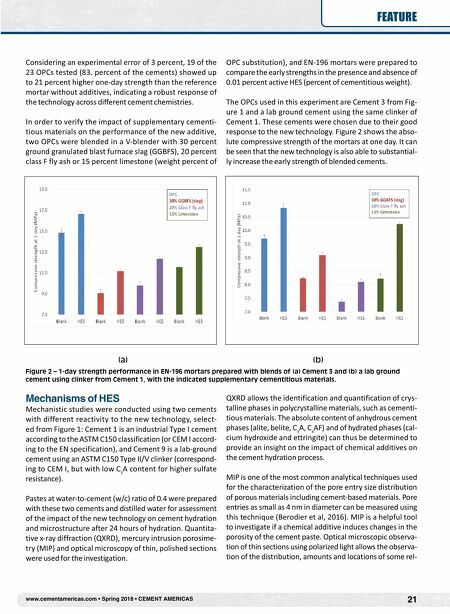 The active content of HES in the mortars ranged between 0.005 percent and 0.02 percent of the cement weight, and the results shown are the best response of the cement within this dose range. In other words, some cements showed a better response with lower dose while others reacted better with higher dose of the new chemical. Figure 1 – 1-day strength performance of the new strength enhancer HES in 23 cements.